This next book in our series of children's books that deal with grief has a famous author, which will often add to the appeal in buying a book. Perhaps from the media's input, I had also already heard of this book before actually getting it from the library. The author, Maria Shriver, points out on the back that this book came from actual discussions with her 6 year old, at the time of the daughter's great-grandmother's death. I think knowing that perspective helps in the review as well, since the previous books Tear Soup and When Someone Dies was written by a hospice worker and grief counselor, respectively. What's Heaven? 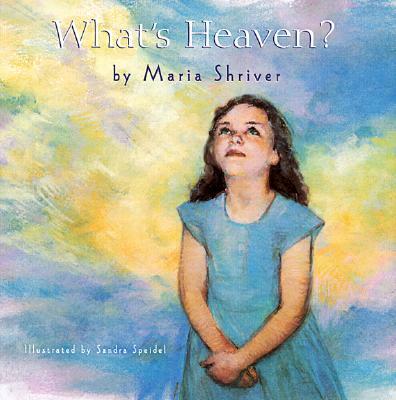 is written by Maria Shriver and illustrated by Sandra Speidel. Published by Golden Books in 1999, the age listed for reading 4-8. Although the title would imply a book all about Heaven there are definitely other topics covered. The plot line follows Kate who comes home to find her mother sad and news that her great-grandmother has "died and gone to Heaven". This prompts not questions about death or what "died" means but questions about what Heaven is. The concepts specifically in question are: Where Heaven is?, Are animals there? and How do you get there? I think these are questions I myself would like to know! There is also discussion about what a funeral is and thanks to cousin Bobby, questions about the actual casket. Here's an example of a conversation Kate has with her mom: "Bobby told me we are going to a funeral where we are going to bury Great-grandma in a box. Why are we going to do that? Will it hurt Great-grandma? How will she breathe in the box? What if she wants to get out?" As is typical of little ones, there are many more questions than answers in the book. As parents have learned, it's more about the concept we are sharing than the specifics of each question. This book is similar, the general message is one of hope; that after death there is a distant, safe place where all the best parts of someone goes... that it's okay to be sad and it won't last forever and that by remembering our loved ones they remain alive in us. The illustrations are done in pastels, with a more vibrant feel than some of the grief books I've seen. The pastel's also allow for a dream like or memory like quality, as sharp details are left out. There are a lot of words on each page, and no paragraphs, perhaps emulating the way children can move from one topic to another in stream-less fashion. Each page does have one phrase that is doubled in font size, I suppose then if just browsing the book you could pick up on the highlights. If you have a child with some of these specific questions, it would be a great book! What's challenging in these types of personal stories, is that your family may not agree with all of the concepts presented. For instance if you don't want to teach your child, "when your life is finished here on earth, God sends angels down to take you up to Heaven to be with him" Then you'd have to either skip the page or do some other teaching on what your family concept is. Stay tuned, we have a few more to review! Thanks for this book referral--it looks really good. For another great source for kids, there is a wonderful Sesame Street series on grief and loss--you may have mentioned it in a previous posting. February 2, 2011 at 3:11 AM This comment has been removed by the author.